The Bielsko Artistic Association Grodzki Theatre was founded in 1999 in the town of Bielsko-Biala (southern part of Poland, 100 km from Cracow, 60 km from Katowice, 30 km from the Czech border). The Association groups artists, pedagogues and culture promoters engaged in artistic work with children, teenagers, adults and the elderly from the socially excluded groups. The latter include physically and mentally disabled persons, people with learning disabilities, children and youths from families at risk, young offenders, victims of alcohol and drug addictions, senior citizens, and all those alienated from the mainstream of social and cultural life. The Association operates mainly in the Bielsko-Biała region, but also covers the whole area of the southern provinces of Poland. We co-operate with national and international organizations, especially in European projects and publishing initiatives. The Grodzki Theatre is the only non-profit organisation in the region of Silesia with such a complex and wide artistic program to combat social exclusion. Grodzki Theatre Assocation employs 66 people with disabilities in its two vocational therapy units (sheltered enterprizes): Printing House and Bookbindery in Bielsko-Biała and the Hotel, Conference and Rehabilitation Centre in the beautiful village of Laliki, Beskidy Mountains. It also runs Occupational Therapy Workshops (arts and life-skills day centre) for 30 people with disabilities in Bielsko-Biała. 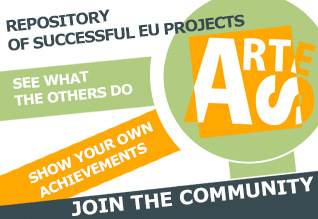 The Bielsko Artistic Association Grodzki has been able to work with people disconnected from the mainstream of social life thanks to many grants and awards from Polish and international institutions and fundations, including the EU programmes, Soros Foundation, Kultura Foundation, Pro Publico Bono Foundation. It has received, amongst others, the Ministry of Culture Award, Government of the Region of Silesia Award, the Best Social Enterprize Award in a national competition in 2011 and REVES EXCELLENCE AWARD 2013, awarded by the European Commission for a partnership project. Bielsko Artistic Association "Grodzki Theatre"
Copyright © 2011 All photos and materials published on the site are the sole property of the authors and Bielsko Artistic Association "Grodzki Theatre". They can only be used with the consent of representatives of the Association or the authors of the work.